Golf bags are often forgotten pieces of equipment, but they're the only piece of equipment that's there for every shot, every round you play until it's time to move on. Some players hold onto bags for years -- maybe decades -- longer than they should. With the innovations in golf bags over the last several years, it might be time to consider a new one. 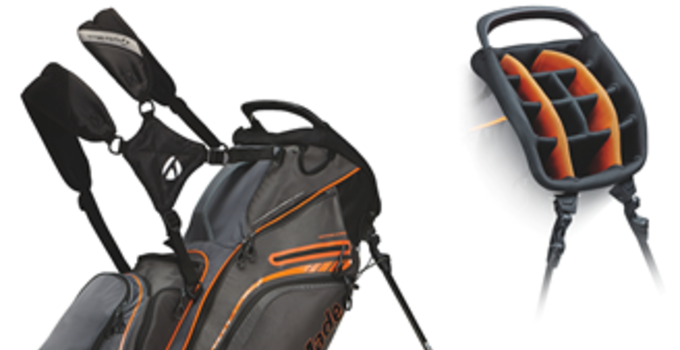 Take a look at three of the golf bags TaylorMade is introducing for 2015 to get a sense of the finer touches making golf bags better and easier to carry than ever. The TourLite bag (MSRP: $170) weighs less than four pounds empty, which puts it in rare company. It comes with all the touches of a modern, light walking bag, including independent stand legs, mesh ventilation and a scorecard slot. The dividers go the full length of the bag, which has seven pockets. The Supreme Hybrid (MSRP: $220) is a big of a bigger bag that's positioned as the right bag for a player who splits their time walking and riding. The top is divided 14 ways -- one for each club -- and can accommodate an oversized putter grip in one of the slots. The bag has 10 pockets, including a double-zippered garment pocket. The base is also designed to fit nicely into a cart so it doesn't flop around driving the links. The Catalina (MSRP: $220) is TaylorMade's cart bag for 2015. It features a 15-way top, including an umbrella slot. It sports top and bottom handles for easy transport to and from the car. It also has a cart lock strap to prevent movement when in place.